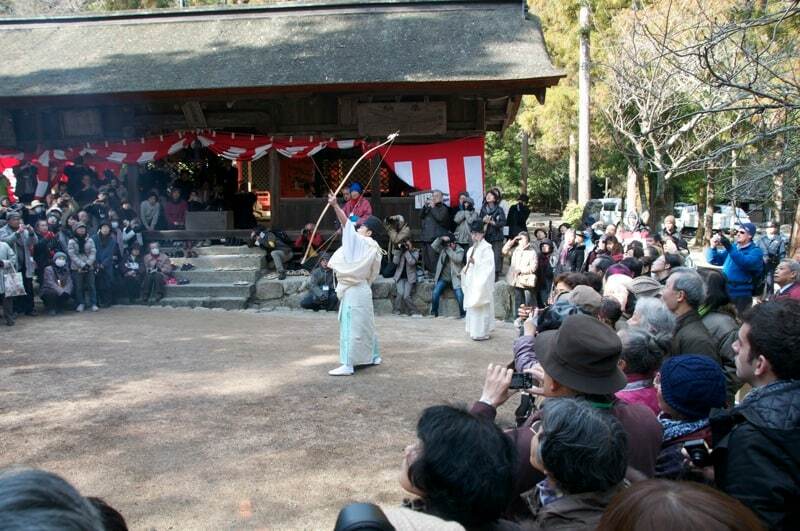 The ritual firing of the first arrow of the year takes place at Ōmoto Shrine on Miyajima every year on January 20. Ōmoto Shrine, just beyond the location of Itsukushima Shrine one of the oldest shrines on Miyajima, actually predating its famous neighbor. 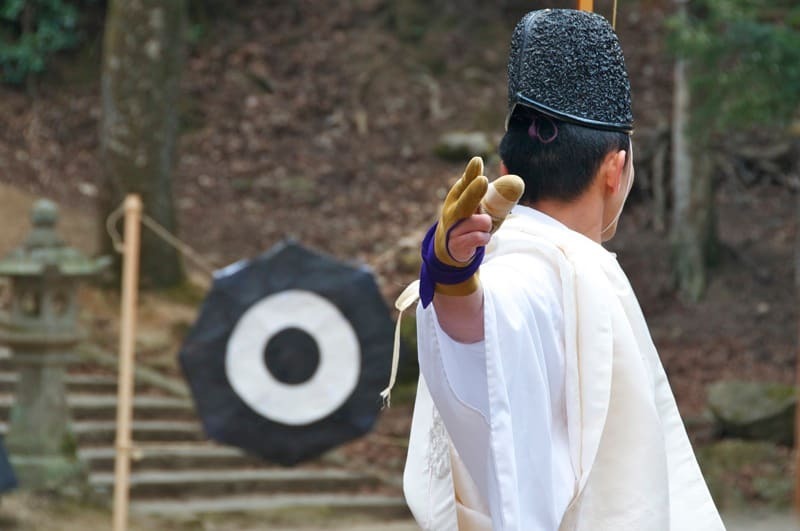 Every year, on January 20th, a firing of the first arrow ritual (known as oyumi-shinji), takes place in front of Ōmoto Shrine. 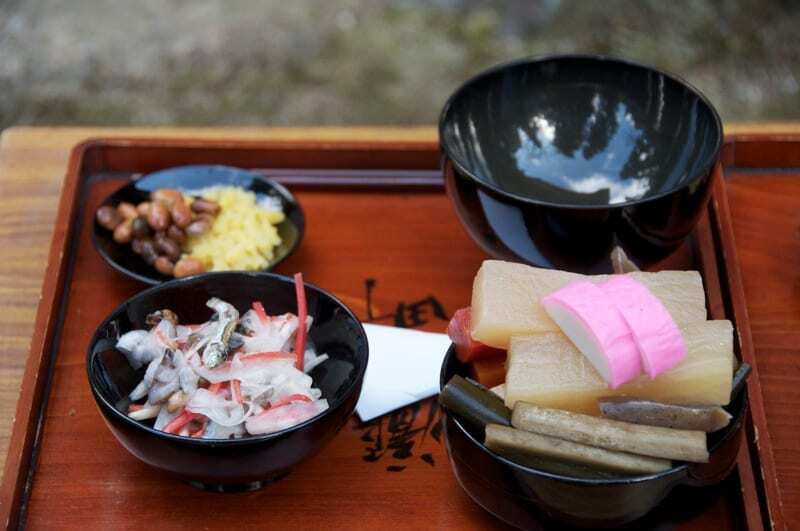 Similar rituals are performed around the prefecture at the start of the new year to ward off evil spirits, bountiful harvests and as a means of weather divination. This particular ritual, however, is said to symbolize a determination to live the year without conflict. The ritual performed today is a combination of two separate rituals held on the island in years gone by. That at Ōmoto Shrine used to involve 100 archers shooting 200 arrows, which must have been quite a spectacle. There are also records of a new year’s archery event held annually on January 7 below Senjyokaku, at which archers shot at a target on which the character 鬼 which means oni, or demon to symbolize the wish for a peaceful year. The two events were combined (and scaled down) in the first year of the Meiji Era (1868) as part of the new regime’s regulations on religious practices. 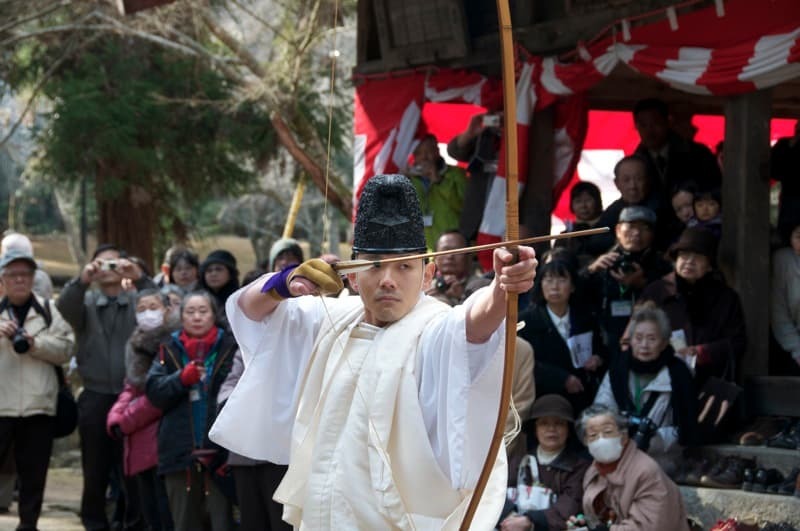 The name of the event momote-sai (百手祭) comes from the Ōmoto Shrine ritual, with the first and second characters meaning “a hundred” (百) “hands” (手) or archers. Nowadays, after various rituals within the shrine building performed by about 10 Shinto priests, one priest (the archer) accompanied by an assistant who carries the arrows steps out into the precinct in front of the shrine building and, watched by many onlookers, “fires” arrows towards heaven, the earth, left and right. He then shoots at a target, 20 paces away, with the character oni (demon) painted on the back. Finally, he shoots towards heaven, the earth, left and right once more. After the ritual, onlookers hang around and line up to receive shrine blessings and be served sacred sake. The event ends on a fun note when the arrows used in the ritual are given out to lucky visitors by drawing lots. 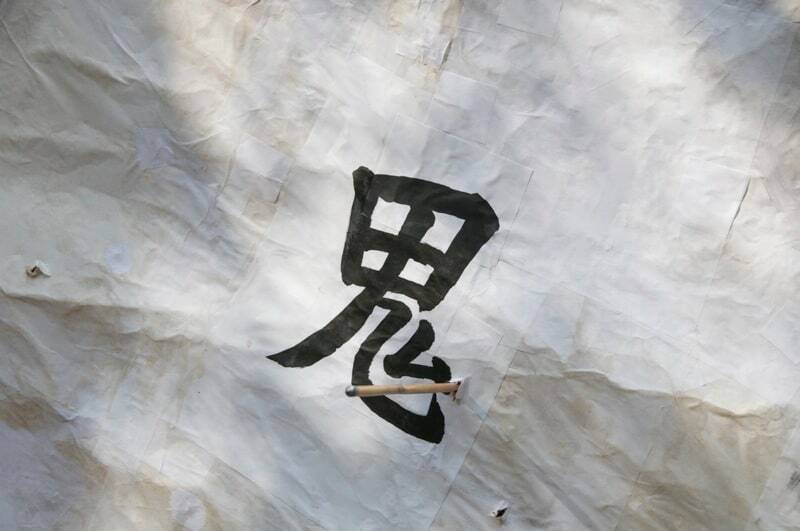 The Momote-sai is held every year on January 20 at Ōmoto Shrine on Miyajima, starting at 11am.